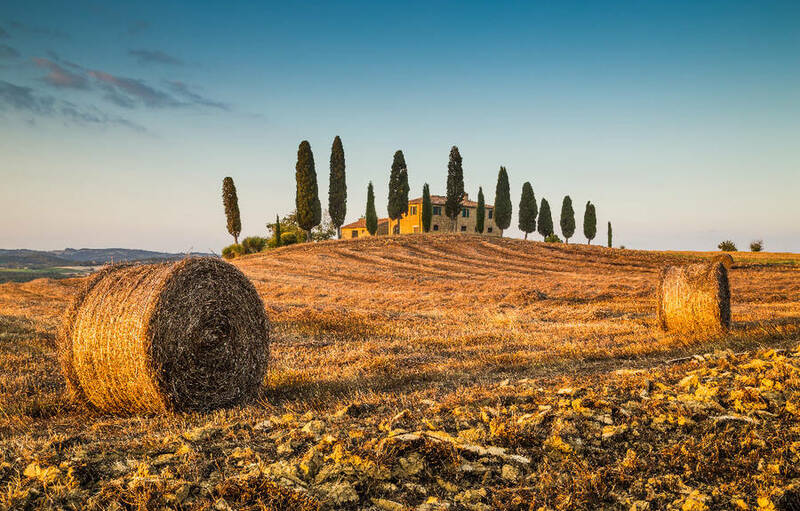 Savor the flavors of Tuscany while exploring its iconic hilltowns and countryside, and Renaissance capital of Florence. You'll see Italy's most famous art and sample its most prestigious wines on this Capritime exclusive tour. You will be sojourning in the Tuscany region of Italy which is rich in Medieval and Renaissance art and architecture. During our excursions in Siena, Pienza, San Gimignano, and Florence, you will benefit from Rebecca Brooks' in-depth knowledge of these cities, their history, customs, and fabulous wines. Upon your arrival in Siena, you will have a historical walk through the medieval city, stopping in the world-famous Piazza del Campo and the Piazza del Duomo before returning for dinner at our hotel. The following morning, we will visit the museum of Palazzo Pubblico, or Town Hall, to see the masterpieces by Simone Martini and Ambrogio Lorenzetti before making our way to the Duomo, where we will view the sculptural masterpieces by Nicola and Giovanni Pisano, Donatello, and Michelangelo. Rebecca Brooks, owner of Capritime Tours, Inc., has lived, studied, and worked in Siena and enjoys the rare privilege of being a full-fledged member of one of the contrada (neighborhoods) of the city. On day three we will head southeast to the first Renaissance town of Italy. Pienza, renamed after the Piccolomini Pope Pius II, is a tiny jewel box well worth exploring. We will visit Pius' Papal Palace and have free time to wander through the quaint streets such as Via dell'Amore, Via del Bacio, etc., before heading to a Cistercian abbey to listen to Gregorian chants in situ. Afterward, we will conclude this magnificent excursion in Montalcino at a world-famous winery for a tasting of some of the finest Tuscan wines. Today we head north to San Gimignano, often referred to as the "Manhattan of Tuscany", to visit the Collegiata and St. Agostino to view the frescoes by Benozzo Gozzoli. San Gimignano enchants its visitors as it has remained unchanged since the 1300's when the Florentines took power. Heading back to Siena in the afternoon, we will stop at the Tenuta Torciano for a spectacular wine tasting. Chianti is not only a fabulous Tuscan red wine, it is the geographical region which lies between Siena and Florence. We will head into the Chianti region, enjoying the breathtaking countryside as we go, taking the Chiantigiana (Highway 222) through the market towns. We will make a stop for lunch and a wine tasting at one of the historic castles before a leisurely return to Siena. Florence holds Italy's patrimony of art within its walls. We will be accompanied by an art historian through the Uffizi Gallery to view the masterpieces of Botticelli, Michelangelo, Leonardo da Vinci, and many, many more. Lunch will be on your own and then we will regroup to visit the Medici Chapels to view Michelangelo's sculptures of the famous figures of Night and Day, Dusk and Dawn. You will have free time in the afternoon in Florence before we return to Siena. Our guests well enjoy lovely suite accommodations at a hotel located in the heart of the medieval center of Siena.